Zeiss announced two new compact full frame prime cinema lenses: CP.2 15/T2.9 and CP.2 135/T2.1. Both lenses will be available in PL, EF, F, MFT and E mounts. The price is US$5,700. Shipping will start at the end of 2012. 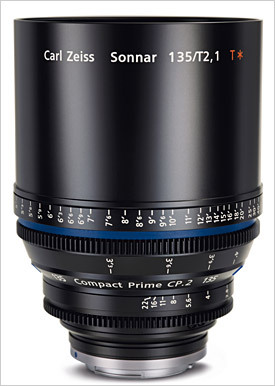 During the NAB Trade Show in Las Vegas from April 16-19, 2012, Carl Zeiss will present two new cine prime lenses. Carl Zeiss is expanding its product range of the Compact Prime CP.2 series with two compact and uncommonly lightweight lenses. With new focal lengths of 15mm and 135mm, filmmakers can enhance their portfolios with these remarkable lenses. The new focal lengths allow professionals to realize creative ideas by expanding the angle-of-view-coverage of the Compact Prime CP.2 series from super wide through telephoto. Thanks to interchangeable mount system, the lenses can be attached to all standard HDSLR models, as well as on professional PL-mount cine and HD video cameras, providing the highest possible versatility. One of the key features of the Compact Prime CP.2 lenses is the full-frame coverage on 36x24 sensors. In this way, the complete angle of view is fully employed and the lenses will remain compatible with future cameras employing this sensor size. "The two new focal lengths round out our existing range of nine lenses between 18mm and 100mm at both ends of the spectrum”, says Michael Schiehlen, Sales Director of the Carl Zeiss Camera Lens Division. “We have expanded our product range with the two new focal lengths in accordance with our customer feedback and in the course of working with photographers and filmmakers. We can therefore offer professionals greater possibilities for their creative process and through a variety of different focal lengths and related accessories, provide everything they need." 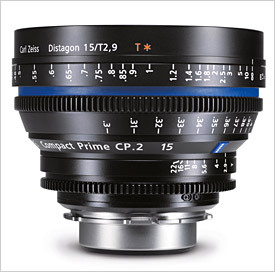 Compact Prime CP.2 lenses are ideally used on film sets for shooting in small, confined spaces. Especially with the Compact Prime CP.2 15/T2.9 the images appear more natural and can be realized without distortion of the image and editing tricks. Thanks to the cine-style housing, all current, standardized follow focus systems can be attached to the Compact Prime CP.2 lenses. The long standard focus rotation of 300° and smooth focus resistance provide excellent control for accurate follow focusing, especially with the shallow depth-of-field found with the large sensor cameras. The 14-blade aperture of all Compact Prime CP.2 lenses creates a round iris opening, resulting in a smooth and natural transition to the out of focus areas. The Compact Prime CP.2 15/T2.9 super wide angle lens provides a broad field of coverage and is perfect for use in confined spaces or to provide dramatic panoramas to help set the scene. Distortion is extremely well controlled and horizontal and vertical lines are accurately captured in architectural settings. The Compact Prime CP.2 15/T2.9 incorporates two aspheric lenses and special types of glass material with abnormal partial dispersion to provide an extraordinary correction of chromatic aberration. Even on cameras with full-frame sensors, the image remains razor sharp out to the edges and details are recorded in the highest resolution. On cameras with smaller sensors the new Compact Prime CP.2 15/T2.9 lens also provides a super wide angle of view. The Compact Prime CP.2 15/T2.9 weighs only 900 grams (1.98lbs). The Compact Prime CP.2 135/T2.1 lens is the longest lens ever added to the Compact Prime CP.2 product line. With its focal length of 135mm and the shallow depth-of-field that comes from using a telephoto, the cameraman can maintain a relatively long distance from the subject while also isolating the subject from the background area. This is especially important for scenes in which the main characters are the main focus and the camera needs to capture expansive movement throughout the scene. Due to the working distance and the long focal length, the captured image looks very natural. At 1.6kg (3.52lbs), the 135mm lens is very lightweight for this product class, and yet, as with all Compact Prime CP.2 lenses, it is sturdy and suited for use in rugged filming environments. “For several years now the trend is towards the use of HDSLR and HD video cameras with accompanying accessories on the set, especially for independent filmmakers, as well as for blockbuster productions. The quality of the filming is approaching a level that just a few years ago was only attainable with professional movie cameras in a much higher price class,” explains Schiehlen. Carl Zeiss offers lenses for every budget – from SLR lenses up to professional cine lenses. Another key advantage of the entire Compact Prime CP.2 series is the availability of interchangeable mounts for PL, EF, F, MFT and E. The mounts can be dismantled easily interchanged by the owner using the instructions provided on the Carl Zeiss website (http://www.zeiss.com/cine/cp2). This broad range of all major mounts offers filmmakers greater flexibility in the choice of choice of cameras depending on their budget of the needs of the project. Filmmakers also benefit from interchangeable mounts when upgrading to other equipment classes, helping to protect their investment from the inevitable changes in digital technology. For example, as independent filmmakers expand their repertoire after their initial success, they can continue to use Compact Prime CP.2 camera lenses thanks to the interchangeable mounts. Filmmakers can continue to use the professional lenses they are already familiar with, regardless of the mount type required by the camera and avoid the costs for expensive new lenses. The Compact Prime CP.2 lenses are color-matched throughout the series and can be mixed and matched without correcting for changes in post. The lenses are available for purchase individually or as part of a custom lens set at additional savings. An extensive range of accessories consists of lens cases, test chart, interchangeable mount sets, as well as adjustment shims are available. The lenses are compatible with camera rigs and follow-focus systems from most major suppliers. The Compact Prime CP.2 15/T2.9 and Compact Prime CP.2 135/T2.1 will start shipping in the fourth quarter of 2012. The recommended retail price of each lens is €4,200 or US$5,700 (excluding VAT)*.